Vice President Mike Pence spoke at Turning Point USA's Midwest Regional Conference on Friday, where he told students and activists that "censorship is the tool of a coward" and that there is a "battle over the closing of the American mind" on college campuses today. Pence added that the Trump administration "will not stand idly by and allow public institutions to violate their students' constitutional rights." "Many college and universities are shutting down debate - stifling conservative viewpoints on campuses," said Vice President Mike Pence at the Turning Point USA conference on Friday, "On too many campuses, policies make it clear that conservative voices are not welcome." The conservative student organization Turning Point USA (TPUSA) is hosting its annual Midwest Regional Conference over the weekend in Chicago, Illinois, where the vice president delivered his remarks in front of hundreds of students and activists hailing from the Midwest. "People in this country know it doesn't take courage to silence free speech, it takes courage to defend it," affirmed Pence, "Censorship is the tool of a coward." "There's a real battle in our country today, it's a battle over the closing of the American mind, and each of you are on the front-lines," said Pence, before mentioning conservative activist Hayden Williams, who got punched in the face at UC Berkeley while recruiting members for the school's Turning Point USA student group. "Hayden's a tough guy," continued Pence, "and as the president said, 'Hayden can take a punch.' The truth is, Hayden took a punch for all of us - but he shouldn't have to." The vice president then brought up another student, Ellen Wittman, who is the president of the Students for Life of America chapter at Miami University. "Ellen was at the White House just last week, she said words I'll never forget," said Pence, "She said 'speech is not free when university officials put conditions on students' speech,' and then she added, 'the only permit we need to speak on campus is the First Amendment.'" Wittman told Breitbart News she was humbled to learn that the vice president had reiterated her remarks at the TPUSA conference. "It is truly incredible and humbling," said Wittman to Breitbart News, adding that she believes her story is not about her, but rather, "about the message that one student can make a difference for the First Amendment on campus by holding strong to their values and defending free speech." "It is organizations like Turning Point USA and Students for Life of America that empower students to stand strong in the face of adversity," said Wittman. Pence reminded his audience that "President Trump signed an executive order to ensure that America's First Amendment protections extend to every college and university campus in America" in response the stifling of free speech on college campuses. "We will not stand idly by and allow public institutions to violate their students' constitutional rights," said the vice president. Pence's appearance at the TPUSA event arrives about one week following the president signing an executive order aiming to hold colleges and universities accountable by withholding federal research funding if a college or university does not agree to uphold the First Amendment on its campus. TPUSA founder and executive director Charlie Kirk attended the signing ceremony for the executive order, which he said was an important moment for him personally, "as this has been the primary mission" of his organization. THANK YOU to our INCREDIBLE. Vice President for keynoting our @TPUSA conference tonight What a humble, faithful, reverent, wise, incredible leader We are so BLESSED to have him as our Vice President!! Among many other topics, the vice president also spoke about illegal immigration, the Democrat Party's radical pro-abortion stance, and how after two years of "reckless accusations by Democrats and members of the media," special counsel Robert Mueller's report on so-called Russia collusion had been "a total vindication" of the president and his administration. 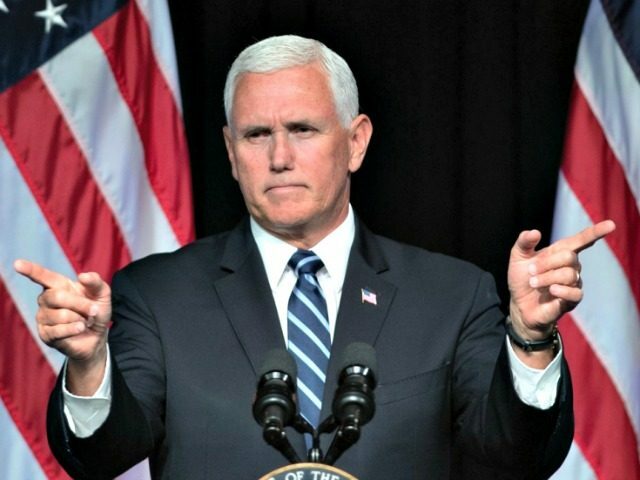 "No matter what you hear from the Democrats and their allies in the media, we have a crisis on our southern border," said Pence on the topic of illegal immigration, "it's like nothing we've ever seen before - Democrats say it's a manufactured crisis, but the only thing that's manufactured is their outrage." The vice president went on to remind the audience that last month, "Democrats in the Senate - including every Democrat Senator running for president - voted against a bill that would prevent newborn babies who survived failed abortions from being killed." "Leading members of the Democratic Party are embracing a radical agenda of abortion on demand," said Pence, "In state legislatures across the country, Democrats have endorsed late-term abortion. The Democratic governor of Virginia openly defended infanticide." Vice President Pence added that while the Democrats embrace a culture of death, "this president, this administration, and this movement will always stand for the unborn. We will always defend the inalienable right to life." The vice president thanked the young attendees for standing up for liberty and encouraged them to continue working with Turning Point USA. "Thank you for all you wonderful young people are doing to defend the conservative values that have always made this country great, and are making America great again," continued Pence, "Turning Point USA is the largest and fastest growing organization dedicated to preserving our birthright of liberty for this next generation anywhere in this country." "You're winning hearts and minds on more than 1,300 college and high school campuses all across America," said Pence, "It's truly inspiring to see."